The presentations for this workshop are available in the MATERIAL section (in the top menu). You can also find photos of the event here (use PIN code 8682). The minutes of the workshop can be downloaded here. The Copernicus programme already interacts with some stakeholders of the energy sector when it comes to traditional or renewable energy plants exploitation, monitoring GHG and climate change, and all via the different Copernicus services: marine, atmosphere, climate, land, emergency and security. However, the full potential of the Copernicus programme in support of the Energy Union is not yet fully explored. 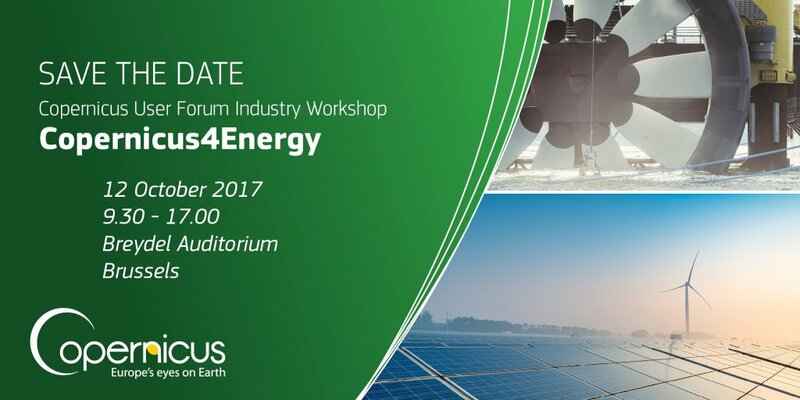 The Copernicus4Energy workshop intends to bring together stakeholders of the Earth Observation (EO) and the Energy sectors, in view of highlighting the potential of Copernicus to contribute to current and emerging needs of the energy industries, and especially the energy transition. The workshop will aim at further investigating the main user requirements for EO-based applications associated with traditional and renewable energy generation and infrastructure in Europe and worldwide. This includes the characterisation and mapping of Copernicus capabilities and existing solutions over the identified user needs and potential evolutions to effectively support energy needs. Additionally, the workshop will look into how Copernicus can support solutions fostering energy efficiency (human behaviour, new buildings, optimisation of energy consumption, addressed also in 'smart cities'),how the programme can provide data and services fostering the development and competitiveness of the renewable energy sector, and how Copernicus can contribute to the monitoring of the impact of EU energy policies on climate change mitigation, decarbonisation, and transition to a low carbon economy and behaviour. The registration will close on 11 October 2017. The workshop venue is walking distance (5 minutes) from Schuman metro station. There is a train connection between Schuman and BRU Airport and the journey takes about 35 minutes.